Destination Weddings – As the name suggests, a emphasis has been given on the term destination with wedding. But there is lots to it. It’s a wedding process which gives a life time experience to the wedding couple and their close friends and relatives. With time, the average age of couples getting married has grown up to late twenties and early or mid thirties in most cases, and thus the couples get to know a variety of places while travelling or by other sort of means. Each mind generates a dream of their own to fulfill during the most remarkable days of their life. Thus generates the demand of an outstation wedding, popularly known as destination weddings. Movies , Wedding Magazines and documentaries gave a add on urge to wedding couples for a list of necessities which they like to be there in a destination wedding. Our country started off with this concept wedding about 12 years back down the lane with top venues like Goa , Rajasthan and Kerala. However globally it started off way back in Hawaii , The Caribbean and Mexican islands and the islands of European countries. A Traditional Ceremony and Reception at a banquet hall or hotels lasts only a few hours, Planning a destination wedding often include more, and are affordable for every budget. A destination wedding allows couples to choose a beautiful, unique destination wedding venue , have a reception you desire , whether it’s a simple dinner after the ceremony or lavish reception in a ballroom , or in a private beach, or in a moon light island , there are plenty of options for fabulous entertainment and customization wedding packages in all price ranges. It was a concept in everyone’s mind who has a brief idea about destination wedding, that is quiet expensive and labor some job to organize it. 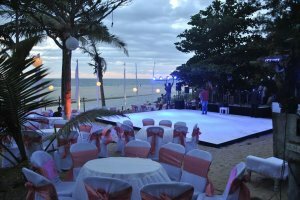 It was partly correct as a good budget was involved and requires a tactful handling of the event to organize a destination wedding. But with time we wedding planners improvised new techniques and budget control system which minimizes the total budget into half with keeping in mind a systematic management system. Within a 5 yr span Destination Weddings became the most concept selling package for any wedding couples in the Northern part of India. Guests used to choose Rajasthan for the Maharajah's Palaces which highlights India, s beauty , and some elegant beaches in Goa and backwaters in Kerala. Very few from the Eastern Part of India got accustomed with these ideas due to lack of a string to this concept. Asparagus Wedding Planners incorporated some wedding packages and start off with some budget oriented destination Wedding Packages within the eastern region and became the string for the wedding couples. We started off with Mandarmani , Junput , Joypur forest and with demand we moved on to the traditional venues like Goa and Kerala. With time guests began to choose combination of nature which helps us promoting the Andaman Islands , Silk Route , and International Venues like Maldives and Mauritius. We started promoting Hindu and Muslim weddings too with the traditional Christian weddings, and special themes for Bengali weddings which itself became a unique selling point for us. Asparagus’s services does not only stopped with vendor bookings like any other wedding planners, but we our self build up a wedding management system in which we offer guest accommodation , travelling , insurance with proper guidance and team managers assisting them through out the event. Individual preferences are also taken into account , so that no one faces any problem during outstation visits. Our team consists of managerial staffs who are both technically and practically sound and takes their role as passion. Destination Wedding is the most specialized concept in the wedding planning business which requires sound knowledge and ideas of each and every prospect without which no planner can formulate the entire event successfully. Now for the budget it depends on various factors , like the type of accommodation , the mode of transport , the menu details, the decor specifications , and off course the destination. An average basic budget destination wedding will cost you around 8-10 lacs (for 100 guests in Mandarmani) for a 3 day package. A Package for similar details for Goa can be within a basic package of 20-25 lacs and can go higher in crores. But with time as destination concept is booming in the wedding industry Asparagus Wedding Planners have brought many customize packages which suits the pocket pinch of wedding couples.